If you care about your lawn, you’ve probably read our fall lawn care tips. We hope you’re taking them to heart and following the simple advice offered in that post to get your lawn ready for next year’s growing season. But there is still more to do this fall where your lawn is concerned. Something you may not have considered is the importance of seeding your lawn. 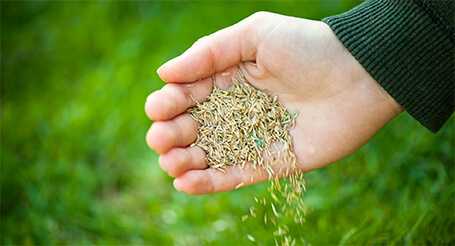 Fall seeding is a great way to beef up your lawn’s health and ensure it pushes up verdant, green and lush in the spring. Let’s talk about what to do and what kind of seed to look for. To be honest, the best time to do fall seeding has already passed. Mid-August to mid-September is your preferred window for this activity. But all is not lost. Hold off until November. By then, grass will be dormant, so seeding during this notoriously cold month is called “dormant seeding”. This practice can really help your lawn come back with a vengeance when the time comes. That’s especially true if you’ve been living in drought conditions that haven’t permitted watering your lawn as much as you’d like. Your existing grass needs to be treated with care. It’s still alive and its roots should be good to go. But being overly-aggressive with the seeding process can interfere with its ability to recuperate in spring. Instead of using a power rake, use a hand rake, for this reason. By doing this, you can preserve existing grass, while introducing the seed. Not all grass seed is created equal. Don’t reach for the large economy size because it’s cheap. Chances are that the inferior price indicates an inferior product. Look for packaging that describes the product as having a low level of inert matter and low levels of weed seed. This indicates a more robust product, for a better-looking lawn. Check for a germination rate of over 80%. That’s going to give you a much healthier lawn than alternatives. Never buy any kind of seed without knowing what you’re getting and educating yourself about the product, prior to purchasing it. Dormant seeding relies heavily on preparation. Getting the soil ready prior to the ground becoming frozen is crucial to your success. Using a hand rake on areas which require a seeding boost is your best bet (especially where there’s existing grass, as stated above). Turn the soil to be seeded at a depth of no more than a ½”. Once the seeds have been introduced to the soil in November, water lightly and leave them to do their thing. Remember to be patient. Dormant seeding works, but if it goes wrong, you can always re-seed in the early spring. The trick is timing and giving your seeds time to show up as grass. No point jumping the gun and wasting all your hard work! Wetscape, a Royal Irrigation Company, is your lawn irrigation expert. Contact us to find out more.